North Korea’s recent test firing of a missile over northern Japan has officials in Tokyo rethinking the country’s long tradition of pacifism. Some Japanese leaders say it's time for a new approach to national defense, one that can include limited pre-emptive strike capabilities and the purchase of additional missiles. Prime Minister Shinzo Abe and the government considered developing a pre-emptive strike policy earlier this year. But facing no immediate threats, the taboo debate quickly faded amid several domestic government scandals. Then on Tuesday, North Korea fired a missile over Japan -- and reignited Tokyo's conversation about defense. "Should we possess pre-emptive strike capability?" the liberal-leaning Mainichi newspaper asked Wednesday, the day after the missile test. "But isn't it too reckless to jump to discuss a 'get them before they get you' approach?" The ruling party’s hardliners have openly urged the government to revise the country’s military plans, while more moderate security experts said Japan should merely consider changes. Abe called the missile firing an "unprecedented, grave and serious threat," while Japan’s new defense minister, the hawkish Itsunori Onodera -- who previously served in the role from 2012 to 2014 -- said Japan must upgrade its missiles. He insisted that more provocations were sure to follow. Prior to his return to the defense ministry Aug. 3, as part of a Cabinet shakeup by Abe, Onodera advocated in March for a military upgrade due to “a new level of threat” from North Korea, the Australian reported. In August, he suggested that Japan should be capable of striking North Korean military bases first. “We should consider it from the perspective of what Japan can do to beef up the deterrent capability of the Japan-U.S. alliance and protect the lives and property of the Japanese people,” he said, according to the Japan Times. "We should consider it from the perspective of what Japan can do to beef up the deterrent capability of the Japan-U.S. alliance and protect the lives and property of the Japanese people." Currently, Japan’s defense capabilities consist of a two-step missile defense system. It has Aegis destroyers with Standard Missile-3 interceptors deployed in the Sea of Japan that can shoot down missiles in mid-flight. If the first step fails, it also has surface-to-air PAC-3s – an anti-ballistic missile capability – that could intercept any projectiles from within a 12-mile range. Experts claim, however, that the system is unable to tackle missiles on a high-lofted trajectory or those with several warheads or in the event of simultaneous attacks on the country. If Japan were to adopt a pre-emptive strike capability, it would have cruise missiles waiting to be fired from Aegis destroyers or other fighter jets toward enemy missiles. 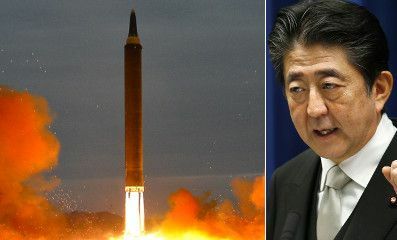 The capability would also allow intercept of an enemy missile from a North Korean launch site – before it reaches Japan. But discussions to develop what Japanese officials call a “strike-back” option could potentially upset China, which increasingly views Japan with suspicion as a potential threat. Signaling Japan's new thinking, the Defense Ministry announced Thursday a record budget of 5.26 trillion yen ($48 billion) to cover the upgrade of the military and its missile defense system. Abe’s steady increase in Japan’s military spending is perceived as part of a broader strategy to take a more aggressive stance in Asia-Pacific and global affairs. His government – after re-interpreting the Constitution – now permits Japan to help defend its allies in the event of attack. But developing a pre-emptive strike capability is still deemed too unpopular in Japan, as polls show the majority opposes it. "Prime Minister Abe seems to have turned hesitant about discussing pre-emptive strikes," said Tetsuo Kotani, a senior research fellow at the Japan Institute of International Affairs. He added that Abe's declining approval ratings may stop him from pursuing the issue, forecasting that "Public debate of pre-emptive strikes may slow down."